A postdural puncture headache is a headache that occurs after there has been an opening in the dura. The dura is the outer most covering of the spinal cord. The spinal cord is wrapped in three layers of tissue, the pia, the arachnoid and the dura matter. Inside this wrapping, the spinal cord is encased and bathed in spinal fluid. When there is a hole in this covering, the fluid leaks out. Since this fluid supports the brain inside the bony cranial vault, the brain will sag. This puts tension on the brain and its surrounding structures and causes the headache. The hole that occurs in the dura is usually the result of medical procedures, such as a spinal tap. It can also occur spontaneously from sneezing or coughing. The headache is most severe upon sitting or standing and is relieved by lying down. The headache is bilateral and the intensity can be moderate to severe. The longer the patient assumes the upright posture, the worse the headache becomes. Nausea, vomiting and dizziness often accompany the headache. If the headache persists, the cranial nerves can be affected as well. MRI scans can be useful in confirming the diagnosis of postdural puncture headache and are also useful to exclude other intracranial causes of headache. The treatment of postdural puncture headache begins with conservative therapy. A period of bedrest combined with analgesics such as acetaminophen and non-steroidal anti-inflammatories may be all that is needed. Medications that contain caffeine have also been recommended, as well as vigorous hydration and abdominal binders. If the headache persists in spite of conservative treatment, an epidural blood patch is usually effective. 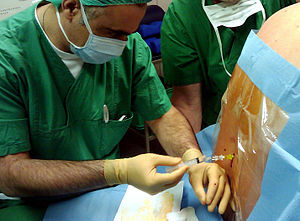 This involves removing the patients own blood from a vein and injecting it into the epidural space in the spine. The mechanism of action of the epidural blood patch is twofold. It compresses the dura which surround the spinal cord and raises the fluid pressure within. It also may form a clot around the hole which is in the dura, thereby sealing it and fixing the problem. There are several technical aspects of the spinal tap that may reduce the chance of post dural puncture headache, such as smaller needle size, horizontal orientation of the needle and choice of needle type. However, in some situations such as a labor epidural, theses choices may not be applicable. Thorough history and physical exam is the best method of diagnosis. Conservative treatment is usually effective and the headache will resolve over time.